If you do nothing else, click here to watch The Power of Introverts (19 minutes). It lays the foundation for my own content, Networking for Introverts. Watching this TED Talk for the first time was a real “aha” moment for me. I already knew I was an introvert, but I had never really thought seriously about the impact it has on my life, and on my business. Susan’s premise is that introverts are valuable, but undervalued by society. They are pressured to work in groups, and to be outgoing, while, as she puts it, they are really rather excellent as they are! I related so much to the TED talk that I chose her book, Quiet: The Power of Introverts in a World that Can’t Stop Talking, for my book club discussion that year. I also started writing for a blog called Introvert Retreat, which is owned by my Canadian Virtual Assistant Janet Barclay. If you haven’t heard, I’m a professional introvert, lol! And not just by virtue of being paid to present at NAPO2017, either. I recently conducted a workshop at a diversity conference offering sessions ranging from racial differences, to sexual identities and gender differences, disabilities, media literacy, homelessness, and introversion. And who do you think the target audience was? Educators? Medical professionals? The media? Social workers? Nope. Are you ready for this? Seventh graders. Yes, seventh graders, at a progressive private school here in Albuquerque, New Mexico. They had folders, name tags, concurrent sessions to choose from, and everything. My workshop, for self-selected introverts, and those wanting to learn more about introversion, was modeled after a book club discussion. (I’ve never known an introvert who didn’t love to read!) We discussed selections from Susan’s latest book, Quiet Power, The Secret Strengths of Introverts, a guide for kids and teens, which is not just a simplified version of her first book, but additive, I think. Last year the same school invited me to participate in a project involving 8th graders. These kids are awesome. So smart, thoughtful, and talented! Makes me wonder how my life might have been different if introversion had been discussed when I was a kid, and introverts allowed to shine in their own quiet way. Maybe not very different. I did OK, I guess. But still, I wonder. And how did that school know to call me? When my phone rings it’s usually someone wanting to get organized, or to talk about organizing. Who knew people were going to start calling me because I’m an introvert? Well… apparently, when you Google “Introvert + Albuquerque” you get “Hazel Thornton”! And why on earth would that be? Well… I was once featured in an Albuquerque Journal article as an introverted business owner, along with the aforementioned Janet Barclay of Introvert Retreat! And how did that happen? Well… the journalist, Donna Olmstead, who had been assigned to write an article about introverts, found the Introvert Retreat blog online (it’s mentioned in Susan Cain’s book) and saw my name. She remembered me from a previous article we had done together about organizing, and gave me a call. And THAT is a form of networking that has nothing to do with making small talk with strangers! A third to a half of all people are introverts, including organizers and their clients. One of the ways that we are impacted in business is when it comes to networking. Who wants to go mingle and make small talk with dozens of strangers? Ack! Introverts do sometimes enjoy social events, but also find them to be a drain on their energy. Conversely, extraverts are energized by being around other people. So when introverts go off alone, it’s not because they don’t like you. They just need to recharge their batteries. Let them. All personalities in the spectrum, from extreme introverts to extreme extroverts, with amibverts (a little of both) in between, are valuable. We each have our strengths and our weaknesses, and we all need each other. Even the Myers-Briggs Type Indicator test includes 8 different kinds of introverts! The word networking, to an introvert, conjures up a horror story of strangers making noisy small talk in a crowded room. But it doesn’t have to be that way. There are lots of ways to network, such as weekly & monthly groups, annual & one-time events, one-on-one coffee dates, social media, hobbies, and social activities. Why not try calling it something else besides networking, like socializing, or relationship-building? And you don’t have to do it like everyone else does. You don’t have to pretend to be an extravert. Although…if you think of a rubber band, can we all agree that there’s something to be gained from occasionally stretching ourselves far enough to do things outside our comfort zones? Like attending networking events, and making presentations from time to time? (TIP: Be the speaker. I know, I know, you’re in the spotlight, ack! But consider that everyone knows who you are and what you do! You don’t have to introduce yourself one at a time.) No need to stretch the rubber band till it breaks, though, and it’s perfectly OK to snap right back into being an introvert, to distance yourself, and go recharge your batteries. Try setting your own agenda to get through a traditional networking event, and maybe even enjoy it. What are your goals? How long will you stay? What existing relationships do you want to strengthen? Is there anyone you’ve been wanting to meet? You can tell yourself: I will make 5 meaningful new connections, and then, if I’m not having fun, I can go home, guilt-free. Don’t be the one who just goes around passing out as many of your business cards as you can, though. Nobody likes that. It’s about quality, not quantity. Don’t forget to follow up with your new connections! Are you shy? Not all introverts are afraid of social rejection, but some are. One way to interact with others, without having to be very much braver than you already have been to show up in the first place, is to offer to help. They might not need help at every type of event, or every time, but if you can get yourself a little micro-volunteer job like handing out nametags, or running door prizes over to the table, you will be meeting people without even trying. Even if they don’t need help you can still do what I call playing hostess. If you see someone who looks lost, ask them if they’re new. Maybe they’re looking around for the bathroom, or the event coordinator, and you can point them in the right direction. Ask them how they heard about the event. You don’t have to work there to show interest, and to help, and to make businesses connections in the process. Introverts can be very creative, good listeners, good thinkers, and good friends. I call these superpowers. What is your superpower, and how can it help you network? What is your introvert superpower, and how can it help you network? As you can imagine, participation during the session was touch and go at first. I enticed the audience, which was predominantly, but not exclusively, introverted, by pointing out that this was their chance to have their say without being interrupted for a change. I added that if no one came up to the microphone and shared, I would be forced to open it up to extraverts! In the end, we had a lively discussion. We all had a good laugh when I asked how many had hotel rooms to themselves. I’m guessing that most of our conference-goers have roommates, but most of THIS audience raised their hands high! Since then, several session attendees have told me which tips helped them get through conference with their energy intact, and have claimed that the session made them proud to be an introvert! 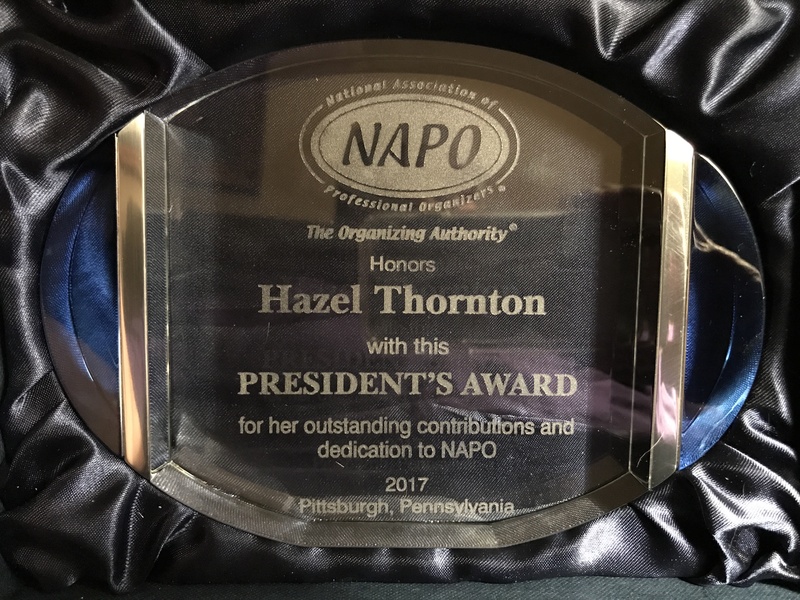 I was honored to receive the 2017 NAPO President’s Award. Picture this: I’ve stretched my rubber band far enough to present Networking for Introverts to a group of 90 professional organizers. All goes well, and I snap back to introvert mode. The next day, I’m sitting in the back of a hotel ballroom filled with 600 of my closest friends (the easier to observe and escape, naturally), minding my own business. Board members are being sworn in, responsibilities changing hands. Suddenly, after a lengthy preamble related to an impending award announcement, I hear my name announced. MY name! Hazel Thornton. OMG. What is happening? It wasn’t a mistake. After a little prodding from my friend Miriam Ortiz y Pino (who keeps a fine secret, and was charged with making sure I was there), and a very long walk up to the stage, with all eyes on me — yikes! — I was presented the 2017 President’s Award for my contributions to NAPO. Then came the very long walk back amidst cheers and well-wishes. Thank goodness I didn’t have to say anything! I was in too much shock for that. I could not have been more honored, or more surprised, to receive this award. Prior to that moment, I had thought of mine as the most introverted, low-profile, micro-volunteer role ever. (Monitoring our association’s internal chat/forum and chiming in from time to time.) But, over time, it added up to something noteworthy. I still think that introverts are underappreciated and rarely recognized. But Ellen Faye, the President of the National Association of Professional Organizers, is a true leader. In fact, she has just been featured in a CNBC article in which she is quoted as saying, about meetings, “I don’t want to just hear from the people who talk a lot. I sometimes go around and ask everyone to weigh in.” Way to include the introverts, Ellen! You are an inspiration to me. Thank you. Are you an introvert? Do you hate to network, or do you love it? Please share your networking challenges and strategies with us in the comments below! I have watched Susan Cain’s TED Talk three times and heard her on the TED radio hour twice. I was disappointed when I read her book, though. I expected more of her storytelling instead of the scholarly tone she employed. The case studies were interesting but I found myself skipping sections, in search of the good stuff. Your thoughts on setting an agenda for networking are critical. Business articles encourage everyone (not just introverts!) to set goals for networking. As an introvert, I am more relaxed when I give myself permission to leave an event after I’ve met my goal. Sometimes I even enjoy myself! Hi Marcie, you should try her new book, Quiet Power, for kids and teens. More friendly, but not childish. I agree that extraverts, too, should set goals for networking, but I don’t think they experience the same kind of anxiety that having goals can relieve. Thank you Hazel! Your post is very helpful. I appreciate your insights. I love how you offer concrete suggestions for introverts to network while honoring who they are and not doing things the “extroverted” way. Congratulations on being honored and thank you for your continued service. I love that you are championing this personality type. Almost all of my family are introverts. I am not a raging extrovert, but in comparison, they think I am:) I am learning all the beauties and wonders of those who value alone time. I imagine there is more to come on this! I love when extraverts (to whatever degree) are interested in learning more about introverts! Hazel – this article is beautifully you! Congratulations again on winning the President’s Award. I really admire you for all you’ve accomplished by embracing your introversion and finding what works best for you – and for sharing your valuable insights with the rest of the world through your speaking and your writing on Introvert Retreat. The other day I met a new virtual assistant who struggles with social anxiety, and I suggested that she come and read this post. 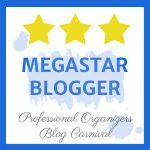 I doubt I would have ever started writing about it (beyond my initial observations on Facebook, that is) if you hadn’t invited me to blog on Introvert Retreat, Janet! 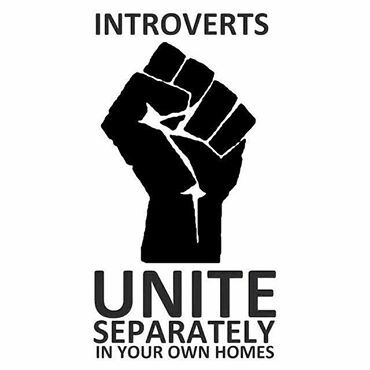 Introverts Unite…quietly…behind their computer monitors….in their respective countries! LOL! I do hate networking! It makes me feel so anxious and uncomfortable. I know it’s important to grow my business but some weeks it’s too much to bare. I have however joined a group of other entrepreneurs where we focus on the business learning end. There I’ve met a small group of people that I feel comfortable chatting with and am able to “practice” on. I like your idea of prepping before the networking event. Setting a goal and allowing yourself to leave guilt free after the goal is met. I’ll have to try that! Good for you, Melissa! You’re networking your way. Let me know how setting a goal and leaving early works for you! Introverts unite, i can be an ambivert, but lean mostly in the direction of introvert. Great post. Hazel- What a beautifully written and deep post! While I’m basically an extrovert, I desperately need my alone, quiet time. I’ve noticed this more as I’ve aged. I love a big party or networking in a business setting, but I most love being face to face and one on one with people in a quiet setting. And even though I consider myself an extrovert, I prefer rooming alone. As much as I enjoy It, it takes a lot of energy to be social. I need that quiet to let that rubber band bounce back before going for more. Congratulations on the President’s Award! What a lovely honor. Thank you, Linda! It was, indeed, an honor! You sound like an ambivert to me. It’s definitely a spectrum. YES! I’ll be there! And I LOVE your comment. Thanks, Sarah! It was such a treat to start off the conference with your outstanding session, Hazel! It gave me the validation to just be me. And then I even had the opportunity to get a photo with you–yahoo! How exciting and deserving that you received the President’s Award!! Just another example of how much introverts can contribute in our own unique ways. Thanks for the encouragement!! As an introvert who has studied a lot about being an introvert, I especially appreciate the tips here. All the networking and socializing mentioned here, the working in a micro-volunteer capacity, are aspects I see in myself too. I love that you have made us as introverts celebrities too at NAPO and in the universe! 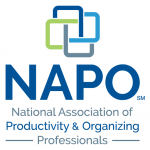 Thank you for your dedication to NAPO and congratulations on your award. What a thoughtful, well written article! So many thing on which I want to comment! What great ideas! I am a writer. At this point in my life, all I want to do is play pickleball and write. I go to the grocery store at five in the morning on occasion to avoid crowds and I carry earplugs everywhere I go. If I had my way, everything that concerns writing and publishing would take place in my room over my computer. So, you can imagine how difficult it was for me to go to the Pike’s Peak Writers’ Conference last month. Even though I have been six times! Even though I am always excited after! So, I used a bunch of these techniques. Got a little job. Talked to other introverts. Scoped out the presenters with whom I wished to share a meal ahead of time and got in line really early. Researched them so if we got a chance to chat I could fall back on that if I came up blank. But the best thing was having my own room, to which I retreated for a few minutes between most sessions. (I went to the next class room first and left my bag on a chair near the back near the door. You know why.) Just using my own bathroom was often enough for a little recharge. I have been six times and each time I have been able to mingle and go to a few more classes. Started out hiding 80% of the time and attending 20% – this time it was flipped. Hi Jane! I’m glad you liked the blog post. And also that your introvert coping skills are improving over time, to where you can enjoy conferences and get more out of them. Thank you for commenting! Earplugs, oh yeah! I often wear my headphones with no sound playing just to block out the noise of everyone else (I don’t want noise in my ears from the headphones… music usually exhausts me. Small doses only, please!